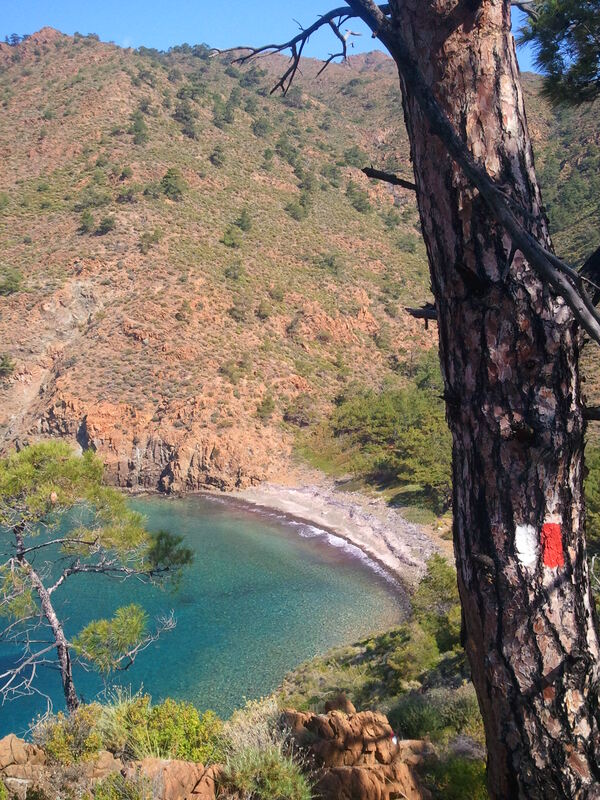 A waymarker on a pine tree (yes, I have to climb up the mountain on the other side of the beach! 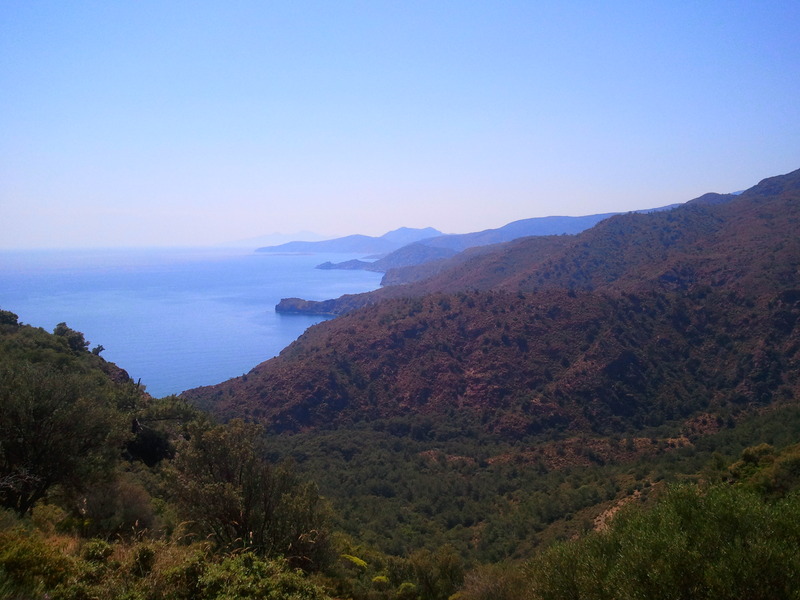 I am walking the Carian Trail, an 800km long hiking route in south-west Turkey. See parts 1 and 2 here and here. 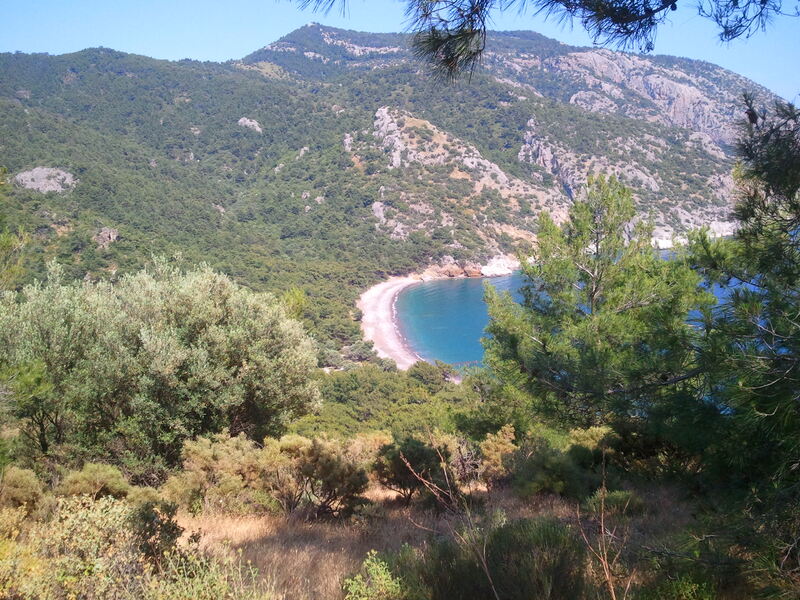 I have started a new section of the Carian Trail – the Datça Peninsula. To my relief, the trail becomes unbelievably beautiful and, thank god, a lot more easy! 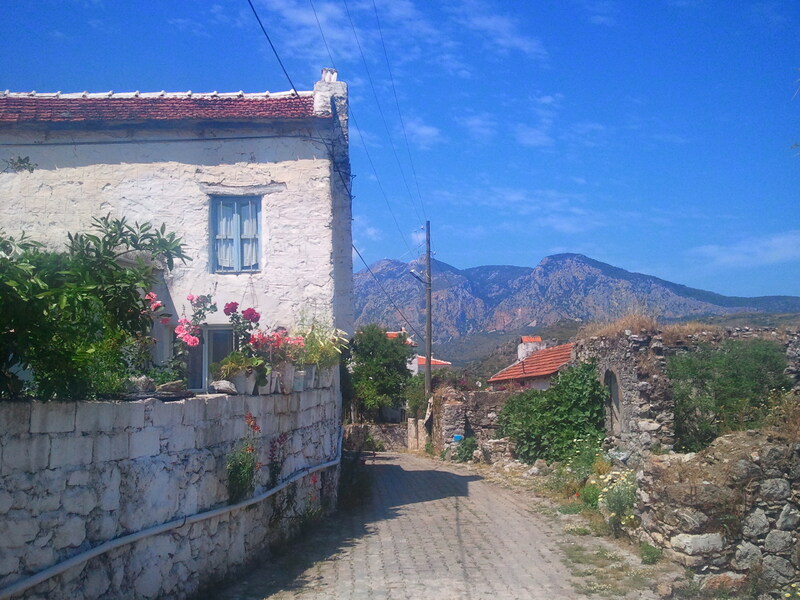 The hike is much more similar to the Lycian Way (hurrah! 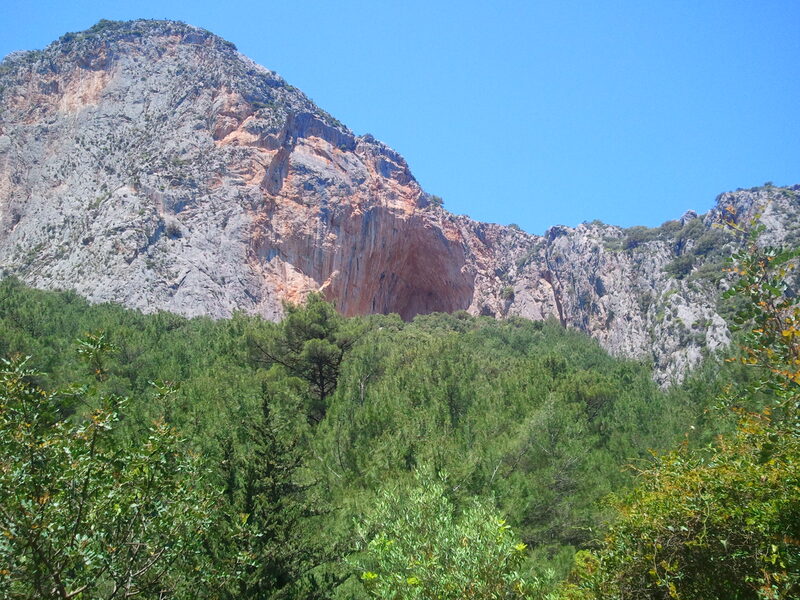 ), with massive limestone rockfaces, pine forest, sea views and a beach that is only accessible by boat or by hiking. No longer am I just surrounded by prickly bushes! I hike to Pigs Hollow. 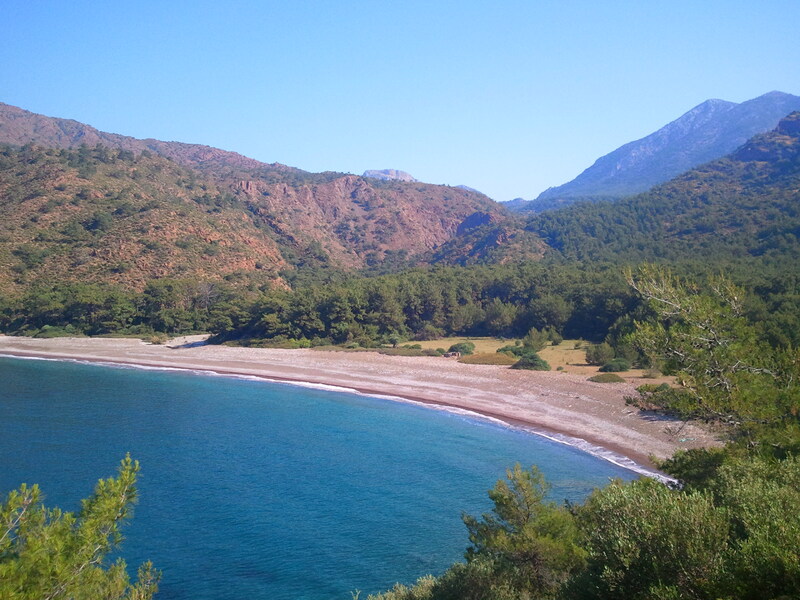 The beach and valley at Pigs Hollow (Domuz Çukuru) used to be a backpackers’ camp, but it closed down two years ago. Now it’s inhabited by two men, a dog called Dırdır, some cats and some chickens. The only access here is by Carian Trail or by boat. The men welcome me and give me dinner, most of which is grown in their vegetable garden. I ask the men what they think of the Carian Trail, and whether they like the fact that it runs through the secluded land that they live on. Naturally, they’re concerned. 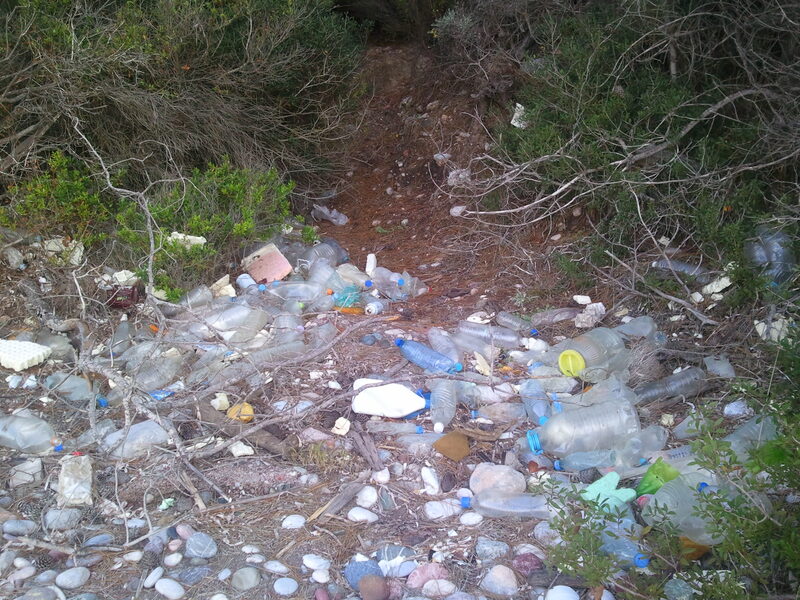 They tell me that they would have preferred for the trail to go on the cliff above the beach, not onto the beach. They tell me that most hikers are older (on those tour-groups that I talked about in part 2), and that when the trail gets more popular, they think it could bring hotels, roads and electricity to this idyllic place, spoiling it. I think about my impact, too. I decide that the hikers on their expensive walking tour-groups are much more detrimental, as they have money to stay in hotels and to buy food at restaurants, and that they don’t camp at all. Us ‘traditional’ hikers stay in a tent and try to leave as little impact as possible. Having said that, I know that I must take some responsibility for potentially affecting the area. I try to sleep in my tent by the beach, but get a restless night: my fearful mind is working overtime again, knowing that there are two men and just me alone on this hidden beach. It’s clear that I need to do a lot more meditation! I start hiking at 6am!! I sit on the clifftop and watch the sun rise. I walk across six idyllic deserted beaches, but I’m upset and a bit disgusted by the amount of plastic and rubbish washed up on them. When are we going to wake up, take responsibility and use alternatives to plastic?? I arrive at Death Valley, a beach in the middle of nowhere, in between two mountains. Coincidentally, Death Valley smells of death. A body of some sort is decomposing somewhere on the beach, and I cover my nose with my scarf so as not to gag. The climb from Death Valley is absolutely huge. It takes me an hour to get to the top of the next cliff. I continue to Ovabükü, which is like a ghost town, with lots of empty or closed pensions. 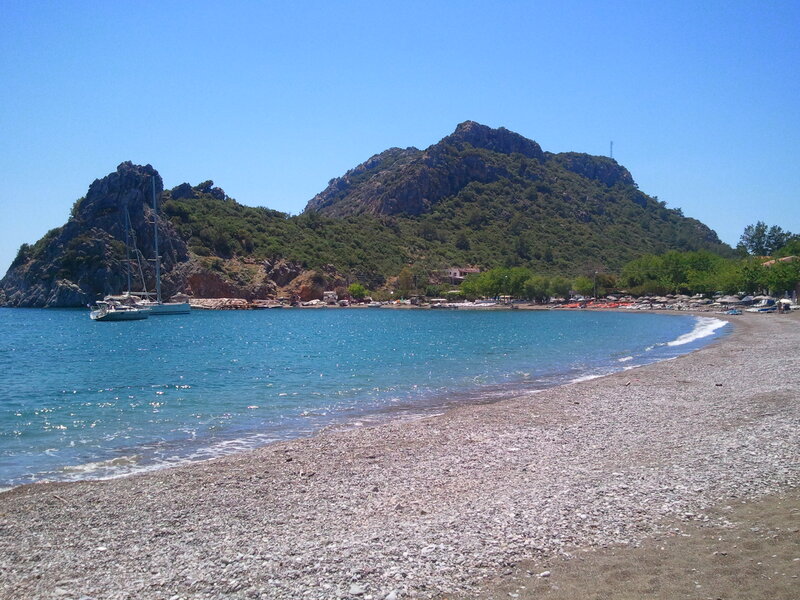 I suppose that in the summer season it’s like a less beautiful Olympos, popular with young Turkish people. I climb to the top of another mountain and lose my way. For about twenty minutes, I follow some goats, hoping they that will lead my back to the trail. instead, they take me over precarious wobbly rocks. Eventually, I find the trail again, and I start the difficult, slow descent down loose rocks to Palamutbükü. 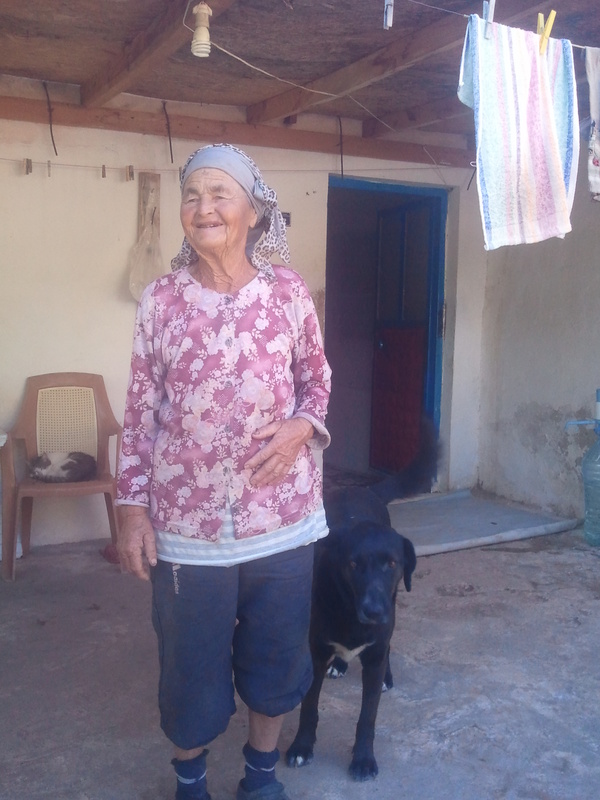 “Gel!” an old lady, armed with binoculars to see who’s coming down the mountainside, invites me to her house for water. She shows me a big scar on her knee and points at the mountain that I have just cautiously walked down, gesturing that it’s dangerous. Palamutbükü had been described to me as “heaven on earth” by a young Turkish guy, so obviously I have very high expectations of this little piece of paradise. Needless to say, I’m disappointed! But maybe in summer season it feels different. As I sit on the beach in Palamutbüku, I have decided that hiking, or any experience actually, is better shared. I don’t mean with any random person. But I mean that it would be better shared with someone that I connect with. The famous quote that Chris McCandless emphasised, happiness only real when shared, goes round and round in my head. Being alone for days on end, seeing no other hikers, has given me lots of time to reflect on the people I care about and has made me really appreciate them. When I started the Carian Trail, I knew that it was highly unlikely that I would meet other walkers, and that I would have lots of time alone, and that was a big appeal to me. I knew that it would be a completely different experience to my other solo travels, where even if I was alone, I would bump into other travellers. But despite my feelings today, I know that I will continue to do other solo long-distance hikes. I know that there must be some growth in both experiences: of travelling with those you connect with and with being so completely alone. 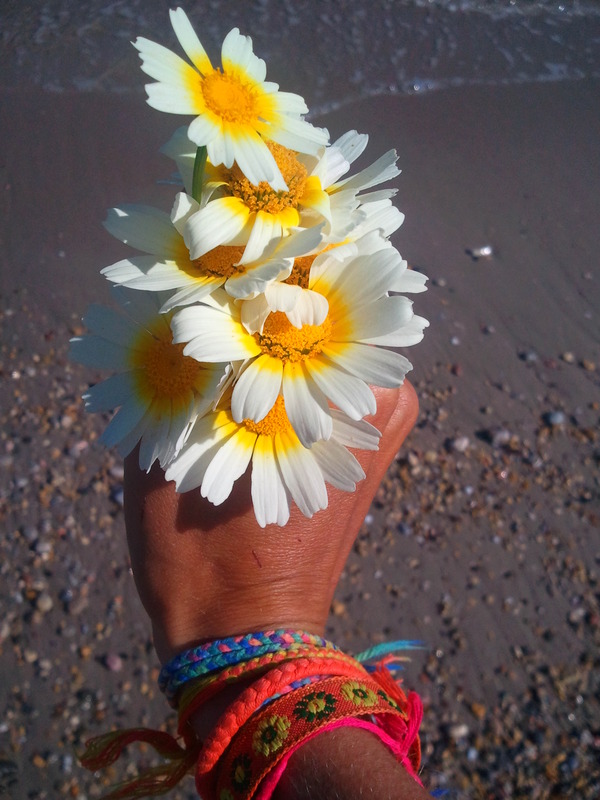 I pick some flowers and think of my good friend Karen. I take a photo of them and I mean to send her the picture. A couple of hours later, Chris calls me from England to tell me that Karen has died. Karen was only a couple of years older than me, and our last contact was on text message, the day that I was leaving England. She told me that she wanted to get away, and I told her that she was welcome to join me in Turkey, but that I would be hiking 18km every day for a month. She said that she wouldn’t want to hold me back. Now, sitting alone on the beach in Palamutbükü, I think to myself how pointless hiking alone has been. How I could have persuaded Karen to join me and we could have spent time together somewhere. I book a flight home to England to say goodbye to our beloved friend. Karen was so completely selfless, kind and loving. One of the world’s most beautiful souls. And I don’t think she even realised these qualities about herself. I hope she knew how much we loved her. Your blog inspired me to visit Turkey last year. I hope to return and walk the Carian trail. I’m sorry for the loss of your friend. thanks david. 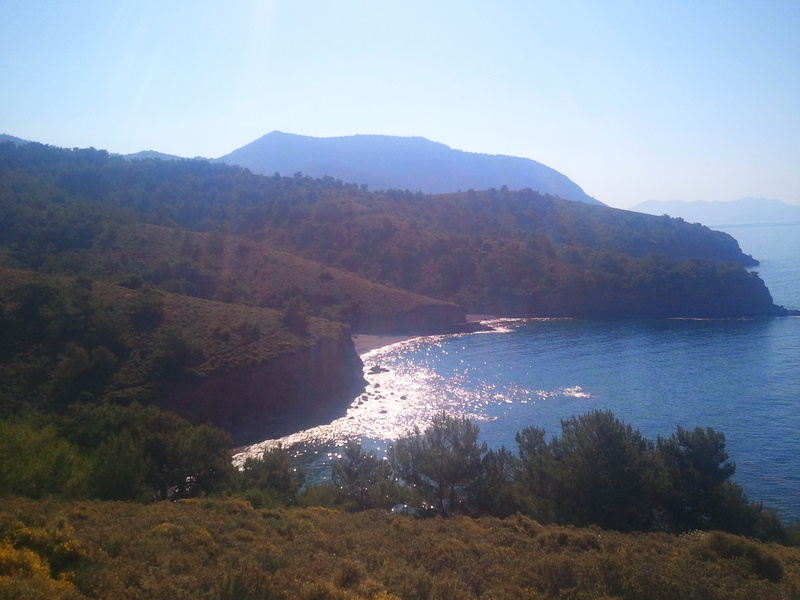 i have one more blog post to write about the carian trail…it suddenly became amazing!! (i am a few weeks behind on my blog-writing and i took a bus from london to sofia and then istanbul after my friend’s funeral and continued the trail). i will write it soon. I really need to update my posts about the Carian Trail! I did go back and I walked the section to Bodrum, and it was by far the best section, with nature rivalling the best parts of the Lycian Way. I loved that section and I highly recommend it! unfortunately I never got round to writing about it. It looks like there’s another section that’s been added since I walked it! i only just saw this comment. you might be on your hike now! i hope it’s amazing. If you can, let me know how it was!